According to some estimates, there are more than 1,000 breeds of sheep worldwide, but not all of them are known for high-quality wool. For thousands of years, the difference between good wool and high-quality wool has been determined by the fibre diameter – coarse or fine. In this regard, deciding which breed to raise is an important decision that each shepherd must make, especially if he wants to grow sheep for wool. Blood System – the oldest method and it’s based on the bloodline or breeding of the sheep. This type cannot describe newer sheep breeds or differences in wool from the same animal. Count System – a more extensive method and divides wool into 14 grades with the count range from 80’s to 36’s. Micron System – the most accurate system of grading and separates wool into 16 classes according to the average fibre diameter as measured by a micrometre. Merino – The breed grows well in arid conditions and produces a high-quality fine-wool fleece. We can find this breed in many countries, and the quality of fleece produced varies considerably, depending on growing conditions and animal husbandry. Spelsau – Also known as Gammel Norsk Spelsau, is a breed of sheep from Norway known for having two layers of fleece: an outer longhaired glossy undulating layer of wool and an underlying layer which keeps the sheep warm. Shetland – Is the smallest of the British breeds and produces wool in several shades, including white, brown, grey and black. The wool is very soft and silky to the touch. Blue-Faced Leicester – has a long, fine and dense wool with lustre. The sheep produce a relatively small weight of fleece for its size. Masham – Is a breed know for his very long and lustrous fleece, used in speciality products due to its limited availability. Suffolk – Is classified as a short-wool and down. This dense fleece is suited to knitwear and any other application where a good bulk is required. 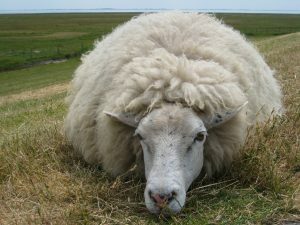 Corriedale – Is a New Zealand sheep breed, and his fleece is a bright white with excellent crimp and soft handle. Devon – Is classified as a long-wool and the wool fleece is one of the heaviest clips in the UK. Tigai – is the sheep of Brasov and Covasna transhumant shepherds. Both types are well adapted to the conditions of the country; however, Turcana may be better adapted to the alpine pasture. Turcana is a sheep breed known as a medium-wool breed. The longest hairs of this breed are 12-36 cm long. These long hairs grow over a denser under wool of thinner hairs, mostly 10-19 cm long. This type of wool is used in the textile industry because it is of good quality (thread fineness is 35 microns). On the other hand, the Tigai sheep wool is semi-fine uniform, with 28 to 32 microns and is used mainly for making thicker clothes and blankets.